The South Korean government confirmed Wednesday that the military had ordered its helicopters to shoot toward protestors during a democratic uprising in 1980, marking a step forward in finding out the military’s involvement during the most violent crackdown on civilian protestors in South Korea’s modern history. 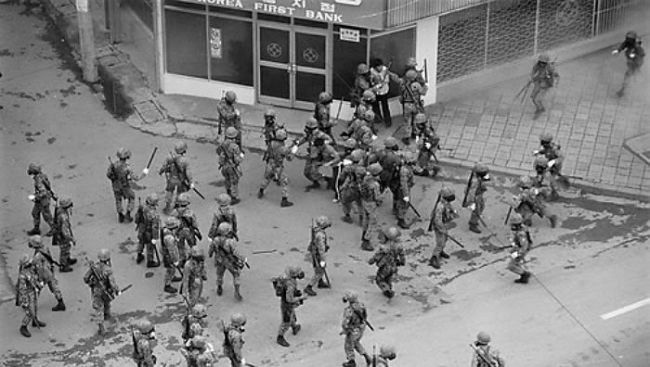 According to the government committee investigating the massacre committed during the Gwnangju democratization movement, fighter jets and Marines were also put on alert for dispatch to the southern city by a martial law command established by former President Chun Doo-haw, who took power through a coup in 1979. Victims of the Gwangju uprising, however, expressed disappointment at the investigation, criticizing the committee for failing to find out whether Chun himself had ordered the military to scramble helicopters and fighters. Chun claims that he never ordered the Army to shoot at protestors. Launched last September under the instruction of President Moon Jae-in, the special committee investigated the military’s response to the Gwangju uprising. Hundreds of civilians and liberal activists were killed during the protest. The special committee said it found evidence that shows the Army had fired shots toward citizens in Gwangju from 500MD and UH-1H choppers on May 21 and 27 -- days after the people in Gwangju rose up against the military junta. Among such evidence found, the committee added, were verbal and written instructions delivered from the martial law command to its subordinate combat command, including specific instructions for helicopter operation. Although the dispatched chopper pilots told the committee that they did not shoot toward the protestors, the government panel concluded that they might have conducted shooting as the choppers were carrying live ammunition. The committee also said that fighters and attackers -- equipped with bombs -- waited for a response to scramble toward Gwangju from airbases in Sacheon, South Gyeongsang Province, and Suwon, Gyeonggi Province. But the panel members said while it was “unusual” for the aircrafts to be put on alert carrying bombs, there was no “clear evidence” that the instruction was designed to have the aircrafts drop bombs at the protestors in Gwangju. The committee also said there were joint operations between the Army, Air Force and Navy to conduct operations to suppress the protestors. The Army and Air Force were directly involved with the mission and the Marines was ordered to be deployed until the decision was rescinded later. However, the government’s announcement fell short of addressing concerns from victims’ families who have long demanded the government find out whether former President Chun had ordered the shooting.